1. 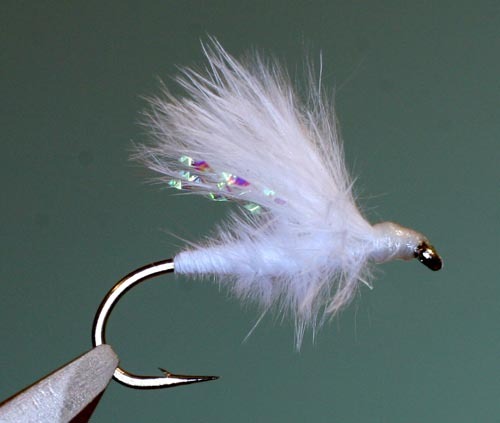 Tie in a bunch of white marabou by the tips. Make sure to choose long pieces from the edge of the feather. 2. Twist and wrap forward along the shank forming a tapered body. Tie off behind the eye leaving enough room for the head and wing. 3. Tie in 4 strands of crystal flash on top of the hook. This should be about the length of the body. 5. Form a neat head with the thread and cement. 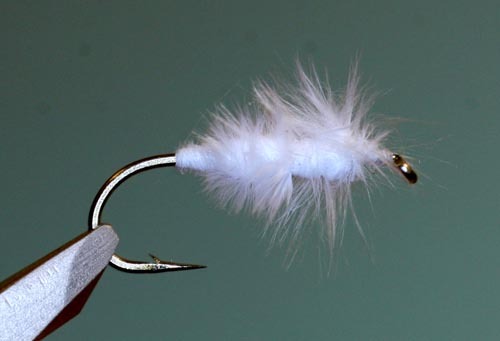 Although originally tied to imitate the adult caddis it imitates a variety of small nymphs. It is extremely effective when fish are feeding just below the surface film and should be fished with a floating line using short slow strips. Can take fish at any time of day and is a must for any South African fly box.